This is not exactly a news flash for long-time Californians. But scientists are starting to put more numbers on the inevitability that we all live with. David Schwartz, U.S. Geological Survey in Menlo Park, told listeners to KQED's Forum program that there's a 63 percent chance of a major quake on the San Andreas Fault sometime in the next 22 years. Apparently that's not enough to worry about, so Schwartz was joined on the program by John Dvorak, author of "Earthquake Storms: The Fascinating History and Volatile Future of the San Andreas Fault." "Earthquakes are not random events," said Dvorak, a former USGS scientist. "Earthquakes are clustered in time and space." He said the 1906 San Francisco quake represented a break along the northern section of the San Andreas Fault. A middle section north of Los Angeles broke in 1857, "but that southern part, south of Palm Springs, that hasn't broken since 1680," he said. Contrary to the popular conception that a quake releases pressure along the fault, thus postponing the next temblor, Dvorak said the likelihood of a second quake rises with the first one. During any given three-day span, he said the odds of a magnitude 7 or larger quake are about 1:100,000 in California. But when a magnitude 7 earthquake occurs, he said the odds of another one at least as big in the next three days go to about 1-in-10. "You don't need to panic," said Dvorak. "You just need to have a heightened awareness that the ground could shake again soon." Schwartz agreed that we can look forward to a whole lotta shakin' going on. "We've got a lot of earthquakes ahead of us." And behind us. Schwartz said that seismologists have a "pretty complete record" going back to about 1600 and that we've been enjoying an eerily quiet interval. 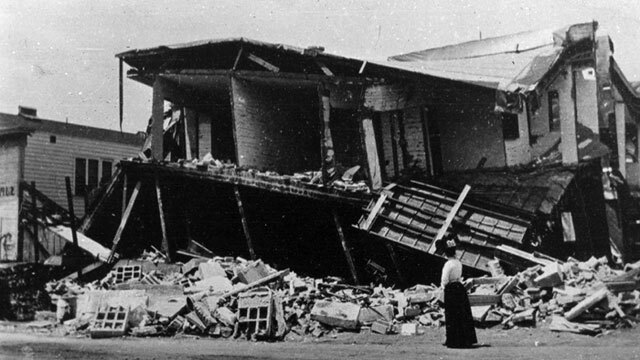 The hundred years or so starting around 1680, "literally every fault in the Bay Area" produced large earthquakes, releasing "almost as much energy as the 1906 earthquake." After that, Schwartz said things went relatively quiet until the "Big One" in April, 1906. But Schwartz said the worst-case scenario for Northern California would be a major break along the East Bay's Hayward Fault or its neighbor to the north, the Rodgers Creek Fault. "There are two million people who fundamentally live right on top of it," he said. "We've never had a major earthquake in the center of a modern U.S. city and we just really don't know what's going to happen." Meanwhile, three groups that oppose fracking in California released a report warning that a boom in the practice would pose a serious seismic risk to "millions of Californians." Fracking is shorthand for hydraulic fracturing, the technique that uses fluids under high pressure to loosen up oil and gas formations underground. Drilling companies also re-inject wastewater back into the ground, which has been shown to produce minor seismic activity. The report appears to be largely a mapping exercise, which shows more than half of California's "active and new" wastewater injection wells within 10 miles of faults that have been active within the last 200 years. None of the authors are seismologists. Patrick Sullivan, a spokesman for the Center for Biological Diversity, one of the three collaborating organizations, said that the authors consulted with seismologists at the University of California. He also cited recent reports of increased shaking in Oklahoma, where scientists are "evaluating possible links" to oil and gas operations. Fracking has recently been suspected of triggering tremors in Ohio. Many have pondered why last Sunday's 6.7 quake off the Northern California coast did not produce giant, devastating waves. Schwartz explained that tsunamis are produced by the displacement of the sea floor. "That requires sort of an up-and-down movement," he told listeners. "This was a strike-slip fault, where the movement is lateral, side-to-side, so it really doesn't affect the sea bottom." Schwartz also said the temblor was relatively small for that area, citing five other events within 50 miles, bigger than magnitude 7, since about 1900. But he added that smaller events can trigger tsunamis if they cause underwater landslides. Both Schwartz and Dvorak agreed on the need for an earthquake warning system in California, but advised not to look to your dog for guidance in the meantime. "There's no scientific evidence that animals can sense earthquakes before they happen," says Dvorak.